The Network Policy Server (NPS) extension for Azure MFA adds cloud-based MFA capabilities to your authentication infrastructure using your existing servers. With the NPS extension, you can add phone call, text message, or phone app verification to your existing authentication flow without having to install, configure, and maintain new servers. This extension was created for organizations that want to protect VPN connections without deploying the Azure MFA Server. 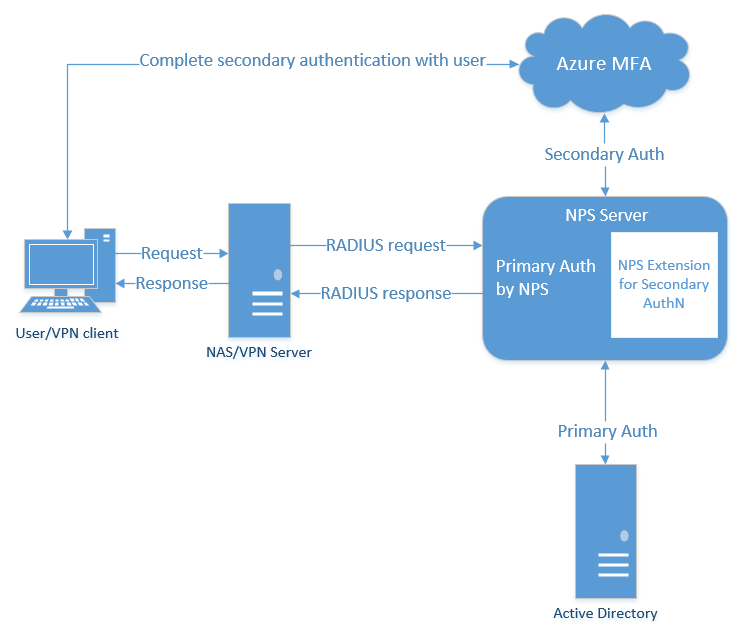 The NPS extension acts as an adapter between RADIUS and cloud-based Azure MFA to provide a second factor of authentication for federated or synced users. The NPS extension automatically handles redundancy, so you don't need a special configuration. You can create as many Azure MFA-enabled NPS servers as you need. If you do install multiple servers, you should use a difference client certificate for each one of them. Creating a cert for each server means that you can update each cert individually, and not worry about downtime across all your servers. VPN servers route authentication requests, so they need to be aware of the new Azure MFA-enabled NPS servers. The NPS extension is meant to work with your existing infrastructure. Make sure you have the following prerequisites before you begin. The NPS Extension for Azure MFA is available to customers with licenses for Azure Multi-Factor Authentication (included with Azure AD Premium, EMS, or an MFA stand-alone license). Consumption-based licenses for Azure MFA such as per user or per authentication licenses are not compatible with the NPS extension. Windows Server 2008 R2 SP1 or above. These libraries are installed automatically with the extension. The Microsoft Azure Active Directory Module for Windows PowerShell is installed, if it is not already present, through a configuration script you run as part of the setup process. There is no need to install this module ahead of time if it is not already installed. 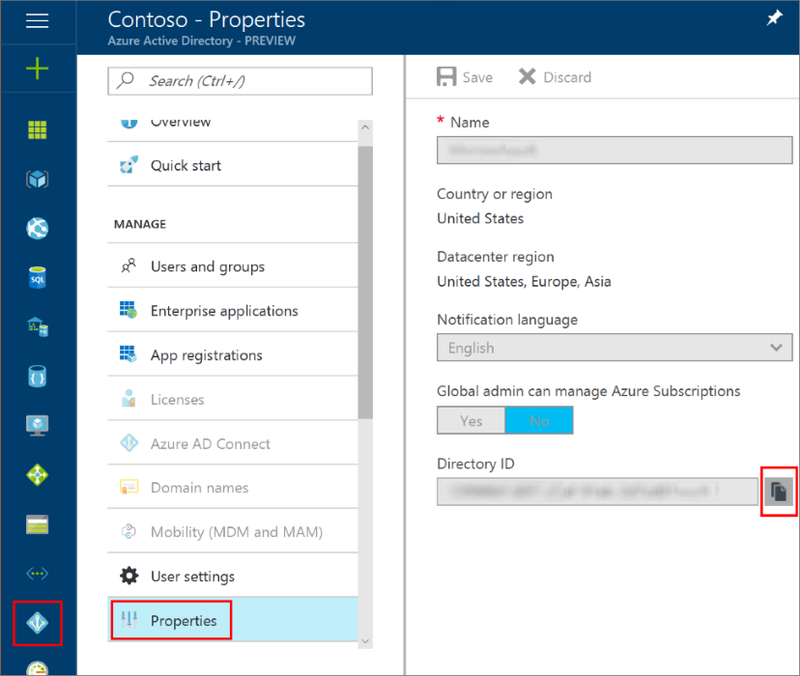 Everyone using the NPS extension must be synced to Azure Active Directory using Azure AD Connect, and must be registered for MFA. When you install the extension, you need the directory ID and admin credentials for your Azure AD tenant. You can find your directory ID in the Azure portal. Sign in as an administrator, select the Azure Active Directory icon on the left, then select Properties. Copy the GUID in the Directory ID box and save it. You use this GUID as the tenant ID when you install the NPS extension. The NPS server needs to be able to communicate with the following URLs over ports 80 and 443. Before you install the NPS extension, you want to prepare you environment to handle the authentication traffic. The NPS server connects to Azure Active Directory and authenticates the MFA requests. Choose one server for this role. We recommend choosing a server that doesn't handle requests from other services, because the NPS extension throws errors for any requests that aren't RADIUS. The NPS server must be set up as the primary and secondary authentication server for your environment; it cannot proxy RADIUS requests to another server. On your server, open the Add Roles and Features Wizard from the Server Manager Quickstart menu. Choose Role-based or feature-based installation for your installation type. Select the Network Policy and Access Services server role. A window may pop up to inform you of required features to run this role. Continue through the wizard until the Confirmation page. Select Install. Now that you have a server designated for NPS, you should also configure this server to handle incoming RADIUS requests from the VPN solution. Depending on which VPN solution you use, the steps to configure your RADIUS authentication policy vary. Configure this policy to point to your RADIUS NPS server. This step may already be complete on your tenant, but it's good to double-check that Azure AD Connect has synchronized your databases recently. Verify that your sync status is Enabled and that your last sync was less than an hour ago. If you need to kick off a new round of synchronization, us the instructions in Azure AD Connect sync: Scheduler. The password encryption algorithm used between the RADIUS client (VPN, Netscaler server, or other) and the NPS servers. PAP supports all the authentication methods of Azure MFA in the cloud: phone call, one-way text message, mobile app notification, and mobile app verification code. CHAPV2 and EAP support phone call and mobile app notification. The input methods that the client application (VPN, Netscaler server, or other) can handle. For example, does the VPN client have some means to allow the user to type in a verification code from a text or mobile app? When you deploy the NPS extension, use these factors to evaluate which methods are available for your users. If your RADIUS client supports PAP, but the client UX doesn't have input fields for a verification code, then phone call and mobile app notification are the two supported options. You can disable unsupported authentication methods in Azure. Before you deploy and use the NPS extension, users that are required to perform two-step verification need to be registered for MFA. More immediately, to test the extension as you deploy it, you need at least one test account that is fully registered for Multi-Factor Authentication. Sign in to https://aka.ms/mfasetup with a test account. Follow the prompts to set up a verification method. Either create a conditional access policy or change the user state to require two-step verification for the test account. Your users also need to follow these steps to enroll before they can authenticate with the NPS extension. Install the NPS extension on a different server than the VPN access point. Download the NPS Extension from the Microsoft Download Center. Copy the binary to the Network Policy Server you want to configure. Run setup.exe and follow the installation instructions. If you encounter errors, double-check that the two libraries from the prerequisite section were successfully installed. Associate the public key of the certificate to the service principal on Azure AD. Store the cert in the local machine cert store. Grant access to the certificate’s private key to Network User. Unless you want to use your own certificates (instead of the self-signed certificates that the PowerShell script generates), run the PowerShell Script to complete the installation. If you install the extension on multiple servers, each one should have its own certificate. Repeat these steps on any additional NPS servers that you want to set up for load balancing. If you use your own certificates instead of generating certificates with the PowerShell script, make sure that they align to the NPS naming convention. The subject name must be CN=<TenantID>,OU=Microsoft NPS Extension. This section includes design considerations and suggestions for successful NPS extension deployments. The NPS extension for Azure MFA does not include tools to migrate users and settings from MFA Server to the cloud. For this reason, we suggest using the extension for new deployments, rather than existing deployment. If you use the extension on an existing deployment, your users have to perform proof-up again to populate their MFA details in the cloud. The NPS extension uses the UPN from the on-premises Active directory to identify the user on Azure MFA for performing the Secondary Auth. The extension can be configured to use a different identifier like alternate login ID or custom Active Directory field other than UPN. For more information, see the article, Advanced configuration options for the NPS extension for Multi-Factor Authentication. Not all encryption protocols support all verification methods. Once you enable MFA for a RADIUS client using the NPS Extension, all authentications for this client are required to perform MFA. If you want to enable MFA for some RADIUS clients but not others, you can configure two NPS servers and install the extension on only one of them. Configure RADIUS clients that you want to require MFA to send requests to the NPS server configured with the extension, and other RADIUS clients to the NPS server not configured with the extension. You can choose to create this key and set it to FALSE while your users are onboarding, and may not all be enrolled for Azure MFA yet. However, since setting the key permits users that aren't enrolled for MFA to sign in, you should remove this key before going to production. How do I verify that the client cert is installed as expected? Self-signed certificates generated by the AzureMfaNpsExtnConfigSetup.ps1 script also have a validity lifetime of two years. When verifying that the certificate is installed, you should also check that the certificate has not expired. How can I verify that my client cert is associated to my tenant in Azure Active Directory? These commands print all the certificates associating your tenant with your instance of the NPS extension in your PowerShell session. Look for your certificate by exporting your client cert as a "Base-64 encoded X.509(.cer)" file without the private key, and compare it with the list from PowerShell. The following command will create a file named "npscertificate" on your "C:" drive in format .cer. Once you run this command, go to your C drive, locate the file and double-click on it. Go to details and scroll down to "thumbprint", compare the thumbprint of the certificate installed on the server to this one. The certificate thumbprints should match. Valid-From and Valid-Until timestamps, which are in human-readable form, can be used to filter out obvious misfits if the command returns more than one cert. Check that your password hasn't expired. The NPS Extension does not support changing passwords as part of the sign-in workflow. Contact your organization's IT Staff for further assistance. Why are my requests failing with ADAL token error? Verify that client cert is installed as expected. Verify that the certificate is associated with your tenant on Azure AD. Verify that https://login.microsoftonline.com/ is accessible from the server running the extension. Why does authentication fail with an error in HTTP logs stating that the user is not found? Verify that AD Connect is running, and that the user is present in both Windows Active Directory and Azure Active Directory. Why do I see HTTP connect errors in logs with all my authentications failing? Verify that https://adnotifications.windowsazure.com is reachable from the server running the NPS extension. Why is authentication not working, despite a valid certificate being present? If your previous computer certificate has expired, and a new certificate has been generated, you should delete any expired certificates. Having expired certificates can cause issues with the NPS Extension starting. To check if you have a valid certificate, check the local Computer Account's Certificate Store using MMC, and ensure the certificate has not passed its expiry date. To generate a newly valid certificate, rerun the steps under the section "Run the PowerShell script"